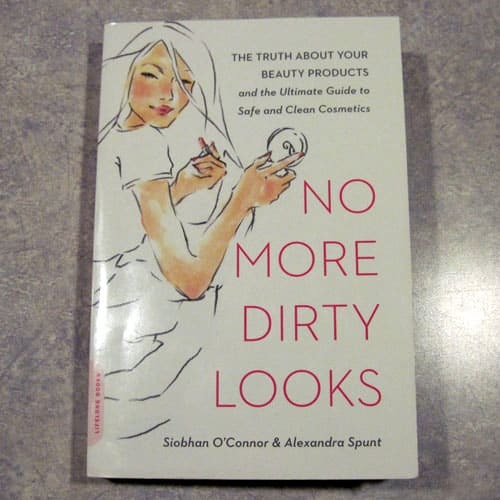 No More Dirty Looks: The Truth about Your Beauty Products and the Ultimate Guide to Safe and Clean Cosmetics by Siobhan O'Connor and Alexandra Spunt is a “must read” for those who use conventional beauty products. Skin is absorbent – this is why transdermal medications work. If you wouldn't put it in your mouth, why would you put it on your skin? The book starts with the authors' story of how they got interested in beauty product ingredients after realizing that the primary ingredient in their “keratin” hair treatment was formaldehyde. (Ever wonder why some salons stink so much? Yes, they are filled with toxic chemicals.) They give a brief overview of the regulations guiding the cosmetic industry (or lack thereof) and a rundown of some of the most common toxins found in personal care/beauty products. Next up, there's a breakdown of products by category (hair, face, makeup, body, and nail treatments), listing most frequent “nasties” and offering suggestions for safe products you can purchase or make at home. Finally, they wrap up by touching on diet and lifestyle suggestions, as well as ways to build awareness and encourage companies to use safer ingredients. Beauty really does start from the outside in, after all. In the diet section, they promote leafy greens and berries and berate sugar and simple carbs, which is good. Unfortunately, they also rip on red meat, and make no mention of bone broth, organ meats and fermented foods – staples of traditional diets and good health. Sorry ladies – we'll have to agree to disagree here. May I recommend reading the book Deep Nutrition: Why Your Genes Need Traditional Foods? I don't use a lot of cosmetics or personal care products, but since reading this book I ditched my Cetaphil cleanser and have been using only coconut oil for a cleanser and moisturizer (so far, so good). I've made some hard lotion bars for moisturizing my skin, which I really like. I'm shampooing less frequently, working towards “no poo”. You can check out several DIY recipes in the Non-Toxic Personal Care Products section of the Green Home page. Hopefully, you'll be inspired to adopt the “why bother” motto as well, and reduce your potential exposure to harmful products. Kim – you're the first person I "know" who has also tried coconut oil straight. I'm at one week in on the hair, and I admit, at this point I'm missing shampoo, but I'm trying to be patient! I think I may use Dr. Bronner's today. I make a lot of my own skin care products (lotions, soaps, etc.) but have found that for me, NOTHING cleanses my face as well as just good old olive oil! LOVE it! I make most of what I use – face cream (and body cream) with coconut oil, almond oil, rose water, aloe and beeswax, cleanser with white clay, ground almonds, oatmeal, lavender and roses, homemade chest rub, etc. I haven’t had success in the hair department though! My hair is dry but quickly gets flat/heavy when I use alternative products. It looks it’s best with regular salon stuff. Waaaaahhhh! I do limit my washing to 2-3 times a week but I HATE what I have to use. Sorry to vent. I’ll be interested to hear how it goes for you. i too have made changes. i use olive oil for my skincare and baking soda for shampoo. i also have very oily hair but i have had great results with the baking soda. I’m glad the baking soda has worked well for you. It’s very frugal, too, which is always a plus. I’ve had great success with the baking soda/vinegar shampoo/conditioner for my hair, but I’m curious what you’re doing with the olive oil and/or coconut oil as a facial cleanser/moisturizer? Are you just wiping it on like a moisturizer and leaving it there so it absorbs, or are you using a lot and rinsing it off? @Janelle, have you tried just the baking soda and water to shampoo, and vinegar and water to rinse (one tablespoon per cup of water on each)? My hair often would get flat or frizzy with “regular” stuff, but it actually feels like it has more body this way. Also, maybe you could do baking soda and vinegar part of the time, and the salon stuff part of the time? I do keep a bottle of traditional stuff in the shower for those times when I step in and realize I forgot to make more shampoo when I ran out, so I’m not 100% “‘poo free” though I am primarily. Maybe a compromise would work for you better? With the oil, I use coconut oil (a friend of mine uses olive oil). At nighttime, I smooth on enough to work in thoroughly, then remove with a warm washcloth. I put on a light fresh layer as a moisturizer. In the shower, sometimes I just rinse with warm water, sometimes I put on a layer of oil, let it soak for a bit, then exfoliate with my finger nails. I ended up being uncomfortable with no poo, so for now I am spacing out my shampooings to wean myself off shampoo slowly, and using Beauty Without Cruelty shampoo.